Uniglobe HSS/College has official links with many business houses, science and technology institutions, corporate sectors and more… in and out of Kathmandu valley so that students have an opportunity to visit and explore various business as well as science and technology oriented knowledge and skills by means of their exposure to commercial and science oriented cultures. The annually organized excursion visits help to build up self confidence in students as well as gain practical experience. Casual visits comprise visits to central library, local tourist spots, botanical garden, religious and social institutions and central science laboratories, and corporate houses in the periphery of the college. The students of Grade 11 Management Stream were taken on an Excursion as scheduled on the academic calendar of this year (23 Dec 2016). The purpose of the excursion was to provide students with an exposure to understand the importance of living a stress-free life. During the excursion students are given enough freedom for self-study and observation so that they could derive rea­sonable entertainment and pleasure from the activities. To provide direct source of knowledge and acquaint the student with firsthand information. To develop power of observations, explora­tion, judgment and drawing inferences, problem solving ability, developing qualities of resourcefulness, self- confidence, initiative and leadership amongst students. The students went on a hiking from Kalamasi to Nagarkot View Tower for 3 hours (back and fro). 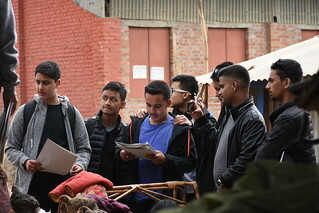 On the way down back to the hotel, the students carried out interviews with business people and families to prepare a narrative report on the bases of questionnaires provided to them on role of tourism industry in economic, social and cultural development of Nagarkot. After the lunch, a session on Stress Management was conducted by Abhishek Ghimire, Program Host of News24-Abako Shiksha and People’s Parliament. The students sang and danced on their tune after the motivational session and headed back to Kathmandu. Click on the picture and find more of the captured moments during the excursion.